It was technically a three-er. Two takes they cut short, and the third take was “the oner”. Pretty cool to not have any editing to deal with. That's still a one-r...don't think they stitched the earlier aborted takes into the final one...? ... it was really about maximizing the sensor so when shooting widescreen you aren't throwing away image area by cropping (which of course is what anamorphic was originally designed for , not to look cool, ha). Haha, I think about this a lot. I’ll defer to you on terminology. And you are correct, there was no stitching. Wasn't Russian Ark the one that was just a single, massive 'oner' for the entire movie? I remember reading about it back in the day, but I still haven't seen it. Actually my memory was foggy, they had three starts, but got it in the fourth one. I had said three total before. I was really into the film when it came out. The way it was like a dream, and went through Russian history. As you all have already mentioned the F900 was the first digital video camera for cinema that looked as good as it did, but the additional advatantage was that it allowed film makers to make a feature length film in one long continuous take. Film mags for 80+minutes on a steadicam? 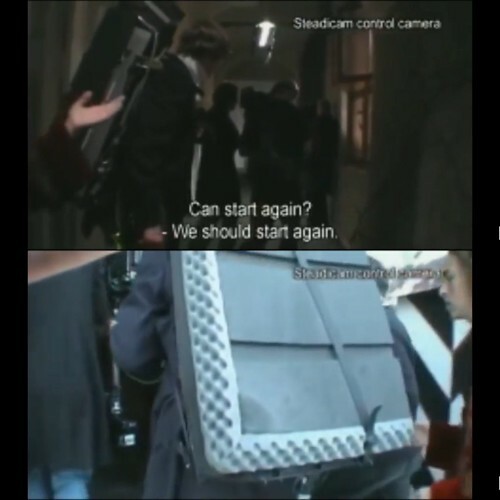 I forget what the Russian Ark crew could record, but they had a guy running around with a big back pack recorder. (the guy that looks like a ninja turtle behind the steadicam. The museum was shut down for repairs, so they had a small oppertunity to shoot and rehearse in the space. The steadicam op, Tillman Büttner, was one of the ops on a short list that could pull this off. The first take was pretty short, before a reset, but they were maybe 10-15min into the second take when they decided to reset again! But after that, it was kind all or nothing. By the end, Büttner said the were muscles he never felt before. They only had 36hrs to do any set dressing, lighting, and shooting. Last edited by James0b57; 04-01-2019 at 09:15 AM.